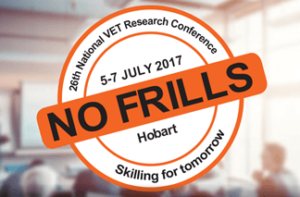 If you are interested in presenting at the 26th National Vocational Education and Training Research Conference ‘No Frills’? The National Centre for Vocational Education Research (NCVER) is now accepting abstracts for both oral and poster presentations from industry, practitioners, policy makers and researchers. We strongly encourage both new and experienced presenters to apply. Contribute to the future of vocational education and training (VET). Promote your work at a major national research conference to research, industry, practitioners and government representatives. Network and share ideas with other professionals. ‘No Frills’ is a well-known annual national conference where researchers and practitioners in the VET sector come together to present, discuss and share information about key issues confronting the sector. Co-hosted with TasTAFE, the conference is being held in Hobart from 5 to 7 July 2017. All abstracts must be submitted online by 5pm on Monday 20 February 2017. For more information.